William Hughes is a provider of top end cleaning, finishing and passivation services for the aerospace, defence, nuclear, oil and gas, medical and electronics industries where precision cleaning for parts and assemblies is an essential part of the production process. AC Services, formerly of Yeovil, Somerset, has over 30 years’ experience in ultrasonic cleaning across the aerospace, nuclear, electronic, medical and commercial industries. In 2015, the Company was taken over by William Hughes Ltd and moved to William Hughes headquarters in Stalbridge, Dorset. 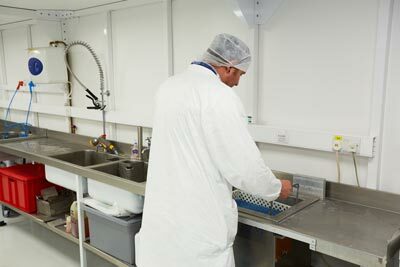 From this base the team continue to offer the same high quality ultrasonic cleaning service from upgraded facilities within a new 80m² Class 7 clean room constructed in accordance with ISO 14644-1, the equivalent of a Class 10,000 clean room using the Fed Stan 209E. Precision cleaning is offered for parts, assemblies and components, for use in oxygen, hydraulic and other critical applications. We also undertake general cleaning where the parts, assemblies and components are for universal applications. We offer a range of specialist services including ultrasonic cleaning of critical components to the highest international and governmental approval standards. We use ultrasonic and non-ultrasonic cleaning techniques for military and electronics spec components for applications including LOX, Oxygen critical parts and hydraulic hoses. We can also work to custom procedures for customers with special requirements. A contaminated component/assembly in your system could result in a chemical reaction, an explosion and/or a total system or device failure – so cleaning is an essential operation. All of our staff are trained and take the utmost care with customer parts and we ensure that all cleaning is compatible with the part being processed to prevent damage. Our lead times are typically 5 working days from receipt of parts although we do offer a premium 24 hour service where possible. Solvent cleaning is used predominantly for metallics and we can cater for most of the solvents on the market. We can vapour clean and ultrasonic clean in the solvent or a combination of both. Aqueous cleaning is used predominantly for non-metallics such as rubbers or plastics or a combination of these with metal eg a hose. Oxygen, LOX, Hydraulic and other critical components can be cleaned to the most demanding quality standards, approvals and specifications. Degreasing of parts and components can be undertaken using a variety of ultrasonic and non-ultrasonic methods. Inspection techniques include visual, ultraviolet, microscope, endoscope and probe light. Kitting & Packaging including kits of parts in a build sequence to assist build efficiency, the design and manufacture of specialised packaging and special packaging for commercial or industrial manufactured products. 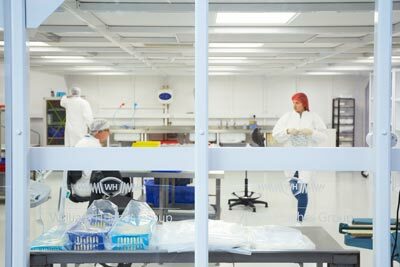 William Hughes has enhanced its existing clean room facilities to accommodate the high specification required by AC Services. 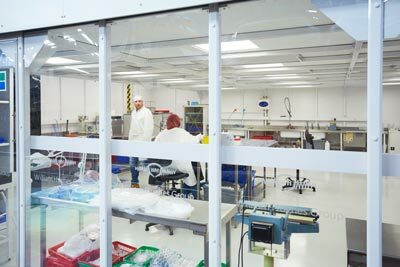 The new 80m² cleanroom is constructed to Class 7 standards in accordance with ISO 14644-1 which is the equivalent to a Class 10,000 cleanroom using the Fed Stan 209E. The cleanroom ensures that hydraulic, LOX (liquid oxygen), oxygen and other critical components can be cleaned to the most demanding quality standards, approvals and specifications. 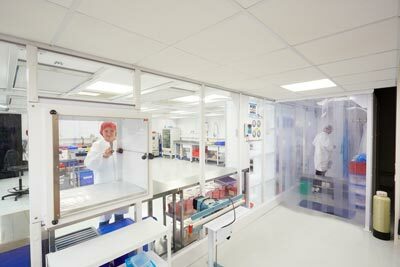 Furnished with high grade stainless steel fittings that are designed to help minimise particulate levels, the open plan clean room has been laid out for optimum product flow based on the latest lean manufacturing methodologies. It is ideal for any company looking to subcontract its cleaning requirements, not just from the aerospace and hydraulics industries, but also defence, nuclear, medical, electronics and oil and gas. 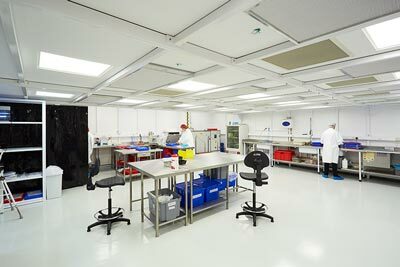 The new clean room, which incorporates an inspection dark room so that parts can be viewed under ultra-violet light, is already being used for oxygen-related cleaning applications, predominantly for aerospace giant Honeywell. Typically, these comprise high precision machined components, springs and other parts that go into oxygen equipment such as breathing apparatus, face masks and ducting. These parts, some of which are also used in liquid oxygen (LOX) systems, are cleaned using approved cleaning solvents and solutions. Cleaned items are placed into hermetically sealed bags that will not be opened again until required for further processing, such as assembly. William Hughes can also offer in-house cleaning verification capabilities. Here, samples are taken from batches that have been cleaned. The samples are rinsed with filtered, deionised water over a 0.45µm filter membrane. Any particulates captured are both counted and examined under a microscope. As a result, customers can rest assured that their components will always meet the specified particulate count. The solvent and aqueous cleaning systems within the new facility can accommodate precision parts up to 300 by 200 mm in size. Along with metallic parts, materials such as rubbers or plastics (or a combination of these with metal) can also be cleaned. Customer care is very important to the company and our quality control system has been developed to ensure that our Clients are provided with the best possible service and product at all times. The following are just some of the materials we are able to process. Our facility at Stalbridge also incorporates a state-of-the-art automated passivation plant offering novel functionality in that there is no manual ‘dunking’ of component baskets from station-to-station, as with traditional systems. Instead, the plant performs a ‘fluid transfer’, moving chemical solutions from holding tanks into the main processing unit as required, thus helping to prevent damage as parts do not move. The entire process is automatic and PLC controlled. Typical treatments are nitric acid/sodium dichromate, and rinse cycles. These are followed by a final rinse in deionised water before a drying cycle. Other innovative plant functionality includes an ultrasonic passivation facility and a rotary option where parts can be rotated through the solution, thus filling air gaps in more complex and tubular-type components, for example. There are three service levels: standard five-day; express three-day; and super express 24 hours [subject to any testing requirements]. The working envelope size available is 520 x 300 x 200 mm. Please click here to download a job application form in pdf format.